You're invited! Enjoy an evening with the Lake County Chamber and other local business associations and their members. 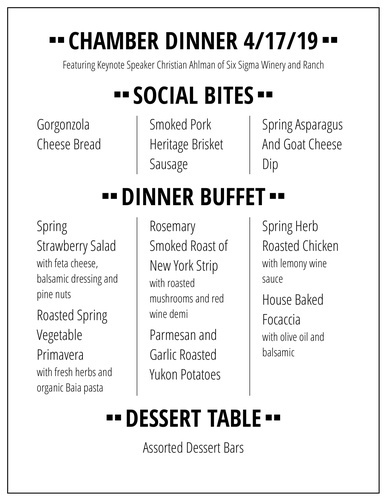 We have a very special guest speaker Christian Ahlmann and a delicious dinner catered by Park Place. Christian will be speaking about Lake County and it's extraordinary assets and potential. It is also still the most economically disadvantaged county in California. But the greatest tool to grow a thriving local economy is small business! As Chamber members and business owners, we will look at best practices for growing healthy companies in our local economy, with a few case-study examples of what has gone right at Six Sigma Ranch (and some of what has gone wrong!) When the evening is done, everyone will leave with a handful of ideas that can be implemented immediately for increased profit. Would you like to market your business by donating a raffle prize?